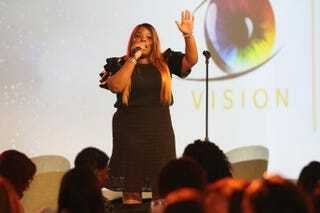 Gospel musician Tasha Cobbs performs for attendees at the Odyssey Network Business Retreat at the Ritz-Carlton Amelia Island in Fernandina Beach, Fla. When it comes to certain jobs and areas of business, women are still grossly underrepresented—doubly so for women of color. As a result, oftentimes, when we interact in these spaces, we tend to put on a different face: always on, always on point, always showing up 110 percent. That, admittedly, becomes exhausting. So the next question is, where do you go to relax, to get some “you” time, to be yourself? It was these kinds of questions that former IBM executive Linda Spradley Dunn mulled over as she conceptualized the Odyssey Network Business Retreat, an invitation- and referral-only event that brings more than 500 senior-level multicultural professional women into one space each year. “As I would attend conferences, I would notice back in the day that multicultural women—African American, Latina, Asian—that we were not always included. We were included from the standpoint of ‘You need a couple of them,’ but not integrated in the program, in the speaking, in our thoughts and what we were going through,” Dunn told The Root. So, along with about nine of her girlfriends, Dunn decided to do something about it, ultimately creating a retreat so that women would be able to get away from all the excess burdens they usually have to bear on a daily basis in demanding, not always inclusive spaces. “Pilgrimage,” she says with a laugh, is a term that the women attending pinned to the event themselves. “Because they would say, ‘I’m crawling to Odyssey.’ We have women who have never missed a year for 17 years. And it is a repeat-activity event for so many of the women who come. So what women get out of it, No. 1, is a safe and trusted environment to relax. And that may seem very basic and simple, but when you are always on—when the public expects you to deliver perfection in your job, family, your power couple to your husband—sometimes you can’t find a space to relax among your sisters,” Dunn explained. From May 31 to June 3, the event, marking its 17th year, was held at the Ritz-Carlton Amelia Island in Fernandina Beach, Fla. The theme was “The First,” and special guests included Diahann Carroll (the first African-American actress to star in her own TV series), Mae Jemison (the first African-American female astronaut) and Vernice “FlyGirl” Armour (the first African-American female combat fighter pilot). But alongside honoring different women and creating an uplifting, sisterhood-type environment, Dunn makes sure that people get their fill of business. After main events and business sessions are handled in the morning, participants got to pick an afternoon activity on Wednesday and Thursday. There is an option to attend more business seminars, but there is also the option of doing things like taking a riverboat tour or learning how to surf. Dunn says that she isn’t trying to form a clique, and new attendees are always welcome, but “we are unapologetic about the fact that you really do have to have a certain life experience, or a certain career, or a certain aspiration in order to come, and what that does is set the tone immediately that we have created an environment," she said.